rosters, easy call management controls and Instant Messaging. But, according to Microsoft research, some 97 percent of meeting rooms aren’t adequately equipped to handle video. In fact, a majority of these rooms host the most rudimentary of collaboration solutions like a digital projector and an audio connection for conference calls. And, while most of these enterprises are adopting Skype for Business for end-users, the reality is that many of their conference rooms lack the ability to connect to Skype for Business calls, which eliminates effective collaboration tools like video and content sharing. 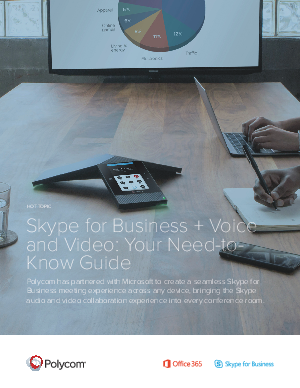 Download this guide to see how to create engaging voice and video meeting experience with Skype for Business.